Couple of nights back (24, April, 08) came an unanticipated opportunity to watch and listen to two of great contemporary pakistani sufi Qawwali singers at famous UCLA Royce Hall. The concert was titled, Qawwali Music of Pakistan: Sufi devotional music.Among the audience was both americans and sub-continental audience. What was striking, is Qawwali's ability to transcend language with its sheer power and captivating devotion. 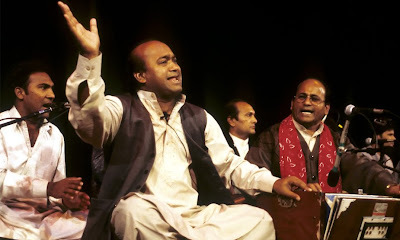 The nature of improvisation makes each Qawwali, even if its sung by the same group of singers, very unique and every new listening is a new experience. Sometime the depth of the verses, fused with the presentation takes audience to an otherly high which was felt last night too. At times there were goosebumps and surges with the strong emotion that is created in Qawwali performance. The Sufi Qawwalis are considered as zikr or Divine remembrance if listened with spiritual understanding and depth. :: What is Sufi Qawwali? | Qawwali is derived from the Arabic word qaul, literally meaning "saying" but has taken on the meaning of "belief"or "credo" in South Asian languages. Qawwali is spiritual in essence; it is the devotional music of the Sufis to attain trance and mystical experience - originating in the 10th century and blossoming into its present form from the 13th century onwards. Strong voices and explosive hand-clapping characterize the devotional music known as Qawwali. An ensemble of usually twelve performers conveys a spiritual message through music and song based on mystic poetry by Sufi masters. The texts usually deal with divine love (‘ishq), the sorrow of separation (hijr, firaq), and the union (visal), these concepts being symbolically reinforced and illustrated by the music. Qawwali blends Iranian and Central Asian poetic, philosophical, and musical elements into a North Indian base, combining popular music with classical traditions. :: History | Qawwali is inseparable from the name of a Persian court musician, composer, poet, and mystic of that period: Amir Khusrau (1254–1325). Amir Khusrau experimented with musical forms, combining the Indian and the Persian, the Hindu Bhakti and the Muslim Sufi to produce the present form of qawwali. Qawwali thus became a popular expression of Muslim devotion open to all faiths throughout Northern India. This form of music rapidly became a vehicle for the Islamic missionary movement in India, while at the same time reinforcing the faith of the Muslims. In many cases, the original Persian mystical text is followed by a translation in the local idiom sung in the same manner as the original. Still in this time, Qawwali remains an expanding form of music enjoying universal popularity in South Asia and beyond. held at the death anniversaries of Sufi saints,in which their death is celebrated as marriage with the Eternal (‘urs). Qawwali groups play day and night, the best performing at the end. Qawwalis are heard by "the friends" (a term denoting members of Sufi orders) and by lay audiences attracted by the occasion. Drawing and holding the attention of a heterogeneous audience is the skill that the performers of qawwali attain. They claim that qawwali breaks the barriers of language and draws people closer to divinity. They do this by attempting to alter the state of consciousness of the audience in order to make them more receptive to the content, which is of a syncretistic and mystical nature. interestingly yesterday's concert was also scheduled on a thursday night, which traditionally is designated in islam as holy night. Pure Qawwali has the quality of Zikr or Divine Remembrance. :: About Mehr Ali and Sher Ali, the Artists | Mehr and Sher Ali were born in the Pakistani border-town of Kasur in the early 1950s and received their earlier training in classical music from their father who was a court classical singer. Their father then became the disciple of Fateh Ali Khan, the father of the famous Nusrat Fateh Ali Khan, and young Sher Ali was the student of Bakhshi Salamat Ali Qawwal. Mehr Ali and Sher Ali thus acknowledge that the family of Nusrat Fateh Ali Khan is their "Ustad Gharana" or "Teacher House," a term imbued with veneration among musician circles in Pakistan and North India. The music of this group has its origins with the Talvandi classical school of Hindustani music. Mehr Ali was taught by Muhammad Ali Fareedi,an ordained Sufi qawwal of the shrine of the 13th century Sufi, Baba Farid. Mehr Ali was thus trained in Sufi philosophy, poetry, texts, and rituals. All qawwals must have a deep knowledge of Sufi poetic texts. The group feels that their music brings harmony and peace to the soul and projects the message of love and unity for all. "We sometimes go into a trance during our performance, so moved are we by the text and music," says Mehr Ali. They believe that qawwali goes beyond the limitations of orthodox religion and is a universal invitation to all living beings to share in the feelings of the powerful emotion of pure love, the pain of separation, and the joy of union. Many qawwali by Mehr Ali and Sher Ali available on youtube are not that good audio quality, but here is a taste of their singing of Qawwali and also another Qawwali via youtube (comparatively better quality). I have also uploaded a badly captured video from this concert @ Royce Hall in youtube. Check it here. with music, lyrics and english translations.